Auctria user Southwest Washington Contractors Association’s (SWCA) auction team -- composed of the SWCA staff, We Plan It (event planning company), and the SWCA Events Committee -- knows what it takes to organize a successful auction. With attendance exceeding 400, SWCA has perfected the art of organizing an auction. Due to their continual success, the auction has become an A-List event in Southwest Washington. What will the audience bid on? What theme will strike interest? What emcees will increase profitability? Donation procurement for this audience is thoughtfully executed, with a steady emphasis on what contractors would want to bid on and win. When seeking donations, the first question is “will the audience want to spend money on this item?” Typically the answers generate items such as: tickets to basketball games, fishing trips, and various trips (including airfare) around the United States. Utilizing a paddle raise is vital to fundraising success. The SWCA Foundation paddle raise helps raise money for scholarships and community projects. The core mission of the SWCA Foundation is to build the community and construction industry. Thus, providing students with scholarships to continue growth in the commercial construction industry is pivotal. Additionally, providing grants to improve the community includes investing in the rejuvenation of local parks and other community services, such as the YWCA SafeChoice Domestic Violence Shelter. The emcees for the live auction are prominent and active members of the Southwest Washington community. Both have had professional or personal connections with many of the auction attendees. 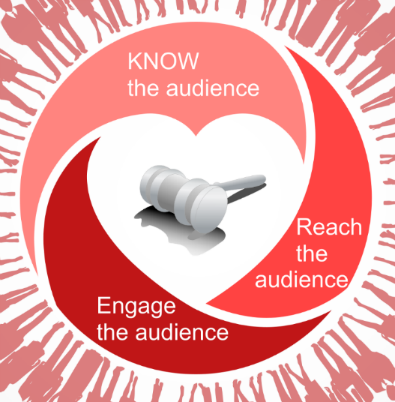 By knowing the audience personally, it gives the live auction a touch of sincerity and helps to increase profitability of items. The silent auction is organized with the goal of mingling while bidding. Some auctions have moved to an online or mobile service, but auction organizers knew that this would not be an appropriate tactic for this outgoing group. It all goes back to the principle of knowing the audience to reap the wanted results. 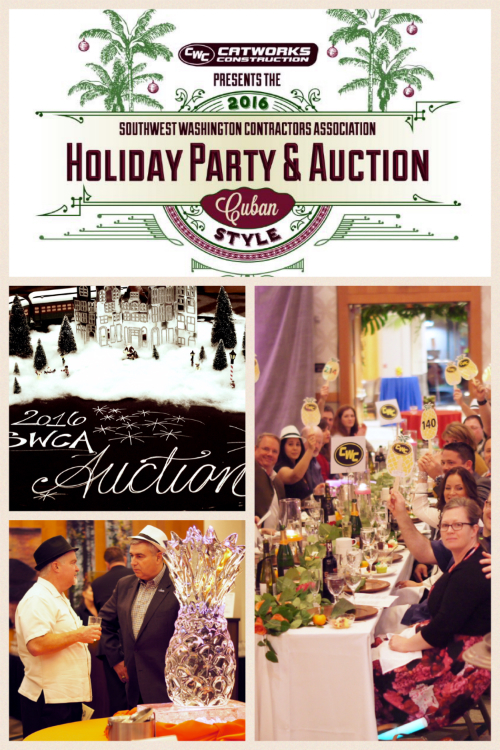 Recruiting efforts for the SWCA Holiday Party & Auction start seven months prior to the event. Knowing that the auction attendees are a generally a social group, SWCA hosts monthly Thirsty Third Thursday networking events. This is just one great opportunity to utilize systems already in place and recruit guests. Save the date postcards are a useful tool to promote the SWCA Holiday Auction. The postcard provides potential attendees with a preview of the theme, and helps to promote the event six months in advance. Another helpful tip includes consistent planning; The Holiday Auction is always the First Friday of December, so recurring guests know a year in advance when the auction will occur. This helps boost attendance for the SWCA’s most prominent event. SWCA used the power of Facebook Ads to reach an audience it ordinarily would not have reached. This proved to be successful, as data shows that for a two-week span, 5,010 people were reached. Approximately 300 people were actively engaged on the SWCA Facebook page during that two-week span. The ad campaign helped SWCA reach four times the audience they would not have reached without the paid campaign, at an affordable cost. In addition, SWCA utilized the Facebook video-maker to showcase auction items. Each video was only thirty seconds long, and gave busy contractors a glimpse of available auction items. The SWCA Auction results over the years have been stellar! In 2015, SWCA members from 7 different companies partnered with the City of Vancouver Parks and Recreation department through a grant from the Community Foundation to restore Marine Park and bring its facilities up to code and make them ADA accessible. These members donated their time, labor and equipment to replace 13 picnic tables and outdated drinking fountains, as well as landscaping improvements. In 2016, the SWCA Foundation provided $3,000 in grant money to the YWCA to rejuvenate the SafeChoice Domestic Violence Shelters. With this gift, the SafeChoice Domestic Violence Program can continue to offer a wide array of advocacy services, which include: safety planning, information and referrals, support groups, emergency shelter, legal advocacy and children's advocacy. These services are crucial to the YWCA in helping survivors escape abusive relationships and avoid homelessness. How to make a Facebook Video Use Facebook videow to capture the attention of FB users by attracting attention. Use images that tell as story. Ask friends to share and tag. Creatd Facebook videos within the FB application. Special thanks to Auctria user Southwest Washington Contractors Association and their auction team: SWCA’s Andrea Smith & Darcy Altizer, Wendy Strum of We Plan It, and the SWCA Events Committee for sharing their success and insight! The SWCA Foundation is a 501(c)(3) with the mission of enhancing Southwest Washington through grants for education and community outreach projects. SWCA Foundation Scholarship Program: The SWCA Foundation is proud to award scholarships to qualified applicants, including those pursuing education related to the building and construction industries. The SWCA Foundation invests in future community leaders by offering financial assistance to students through funds raised by the generous donations of members. These awards are available to association members' employees, their children, and others who are enrolling in full-time secondary education.